The weather in Saskatoon can be hard on asphalt. 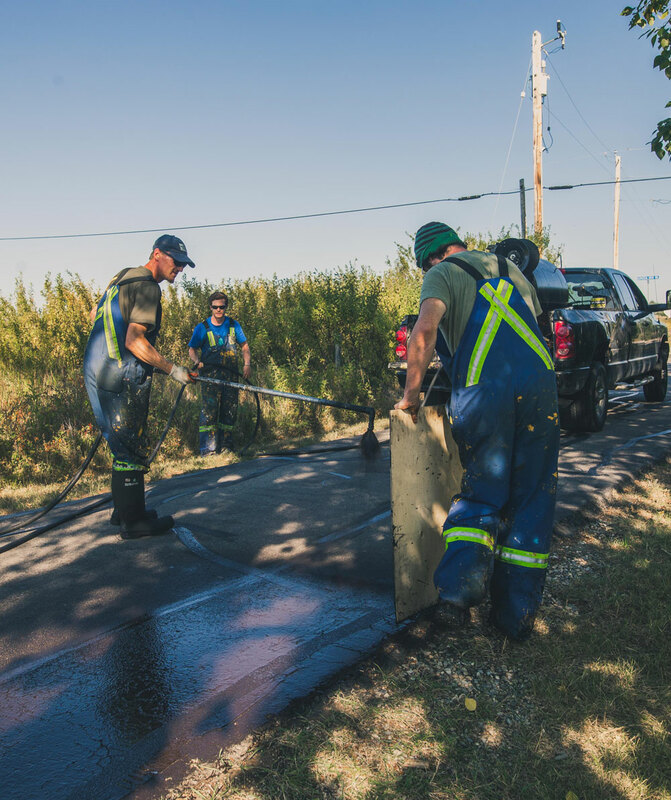 Asphalt sealcoating and crack filling ensures that you not only prevent the need to repave, but you extend the value of your original investment considerably. The weather in Saskatoon can be hard on asphalt. Asphalt sealcoating is a good way to extend the life of your asphalt. The process of sealcoating involves taking an asphalt based waterproofing material and spraying it over the surface. This seals any cracks in the surface, prevents any water from working it’s way in and prevents more cracks and even potholes from forming. In addition to it’s protective properties, it also makes the asphalt look brand new with a clean black top look. If water seeps into your asphalt it severely reduce the lifespan of your asphalt. Asphalt crack filling is a great way to prevent water from getting in. The process of asphalt crack filling involves filling cracks with an asphalt and tar based agent that seals the surface. Up to 75% of cracks can turn into potholes if they aren’t repaired in time and water seeps in. Maintaining your asphalt and filling in cracks protects and retains the stability of the subgrade base extending the life of your asphalt. Annually filling in cracks and maintaining your asphalt is the key to protecting your investment. At EverLine Coatings and Services, our commitment to quality and customer satisfaction gives us the competitive advantage against our competitors. Our CORE quality system allows us to ensure we exceed our clients expectations. Our CORE quality system stands for Clear Scope, Operations Reports, Reach Out and Evaluate. Adhering to this system ensures we always consult our clients to ensure the work we are completing is in their best interest and that our clients can ensure quality throughout all the steps of our services. We aim to provide the best quality of asphalt sealcoating and crack filling services possible. At Everline Coatings and Services, we never thin out our products, we apply asphalt sealcoating and crack filling products according to manufacturer recommendations to ensure the best possible results and the longevity of repairs. Our in-depth repair preparations are also a big factor in providing high quality crack filling and sealcoating services. We ensure that all cracks are cleared and sealed properly and that the ground is free of dirt and debris before sealcoating. This ensures a good bond with the product being used and a long lasting repair. Another step we take to ensure quality is that we always apply two coats of asphalt sealant on the surface to maximize value and durability. We only carry products that are built to take on tough Saskatoon winters. At EverLine Coatings and Services, we have the most industry experience and expertise when it comes to asphalt sealcoating and crack filling. No matter how big or small the job is, no matter the surface you need sealcoated or filled, our trained professionals can help. Whether it is a parking lot, driveway or street, we have all of the needed equipment and products to protect and extend the longevity of your asphalt surface.This will keep it looking good and save you the expense of repaving in the future. Our sealcoating and crack filling services have a variety of benefits. Some of these benefits include but aren’t limited to: substantially slowing down the deterioration of asphalt, better traction and ride quality for vehicles, giving your surface that nice new look, minimizing the environmental impact of repaving and saving you or your business a considerable amount of money since you won’t have to repave the surface. If you will be receiving our asphalt sealcoating or crack filling services in the near future, we have a few steps we ask you to complete in preparation before our crew arrives. This will make the job safer for our crews, more efficient, and ensure a better quality end product.